I love giving people gifts. I truly enjoy picking out just the right things, wrapping them in color-coordinated paper, and tying them up with fancy bows and name tags. I couldn’t imagine Christmas morning without the joy of watching my family unwrap presents. 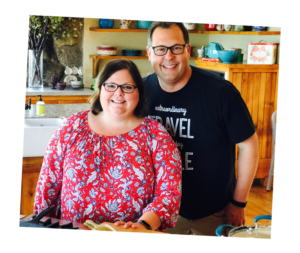 So, months in advance of our Christmas vacation, I began planning how I was going to get gifts, stockings, and wrapping supplies into my suitcase without going over the 50-pound weight limit and still have room for clothes. It wasn’t easy. First, I had to select gifts that were small in size and low in weight so they could easily fit into my suitcase. Here’s what I came up with. 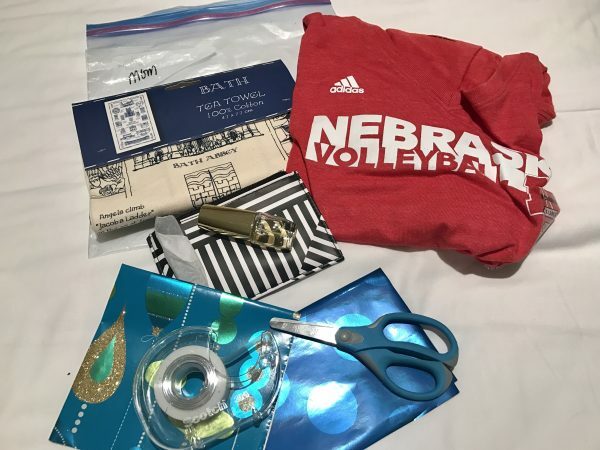 For my mom, I brought a tea towel we got for her in Bath, England, this summer, a Nebraska volleyball t-shirt, and her favorite perfume. The perfume set (Beautiful by Este Lauder) is something my step-dad had purchased every year for her at Christmas. Before he passed away a few years ago, he asked if we’d continue his tradition and get mom the Beautiful perfume she loved to wear. While we couldn’t see packing the large box set, it did come with a small travel-sized perfume, which I could easily pack without taking up much space. For my mom, we brought a tea towel from our trip to Bath, England, last summer, a Nebraska volleyball shirt, and her favorite perfume. I pre-measured pieces of wrapping paper before we left, and brought tape and scissors in my suitcase. Because you are encouraged by TSA to not wrap gifts that are in checked baggage, I laid out each gift and measured the exact amount of wrapping paper I would need for each item before we left. I also included a bow or ribbon and wrote out a name tag. Then, I just placed all of those items in a clear plastic freezer bag labeled with the name of the recipient, sucked out all the air, and packed it away. For Meghan, we decided to get her a couple things she would need for her upcoming trip to England. We bought a her a new water bottle she requested, a travel safe toothbrush holder, and then decided to spoil her a bit with the perfume she’s been asking for for the past three years. Like mom’s gift, the perfume set was too big to bring along, so we wrapped the travel size perfume for the trip, and left the larger set at home. 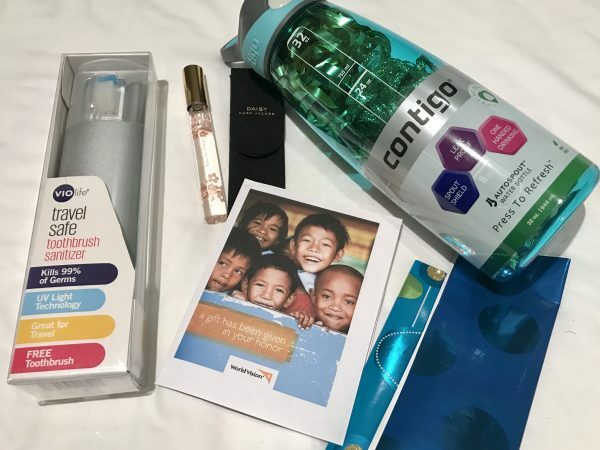 For Meghan, we got a water bottle, a travel toothbrush holder, and the perfume she’s asked for for the past three years. 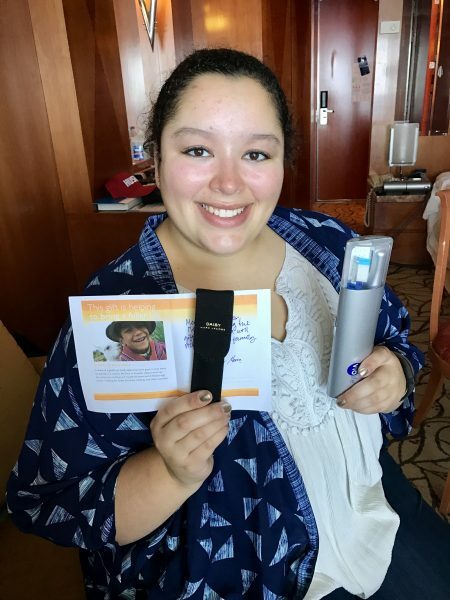 We also purchased a share of a llama in her honor through World Vision. Every year, we also purchase some kind of animal for a family in another country through World Vision. This year, we bought a share of a llama in her honor. Meghan loved her Christmas gifts and was pleasantly surprised to get the perfume she really wanted (but would never buy for herself). She loved everything and the water bottle came in really handy for packing all of the fluffy bows that I wanted to bring and needed to protect from getting squished. 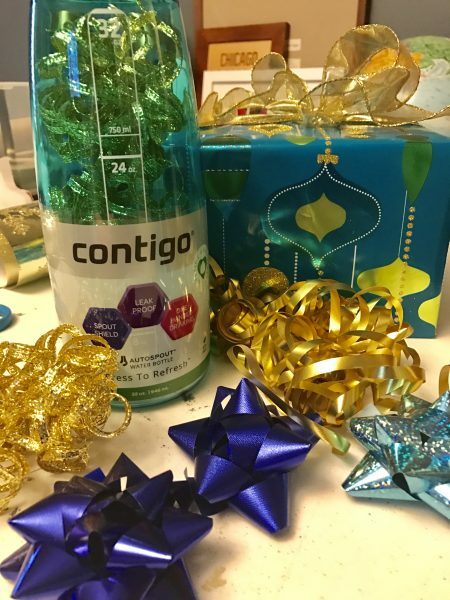 The Contigo water bottle we got for Meg was a great place to store bows and ribbons for the trip. It’s always a bit difficult to find the perfect gift for Steve. But this year, I had an idea back in June and wrote it down. The best part is … I remembered I had written something down five months later! On our last cruise, we took a mixology class where we learned the history of the cocktail and had a chance to craft some incredible drinks with professional bartenders. Steve loved it and has really enjoyed trying new recipes and honing his cocktail mixing skills. 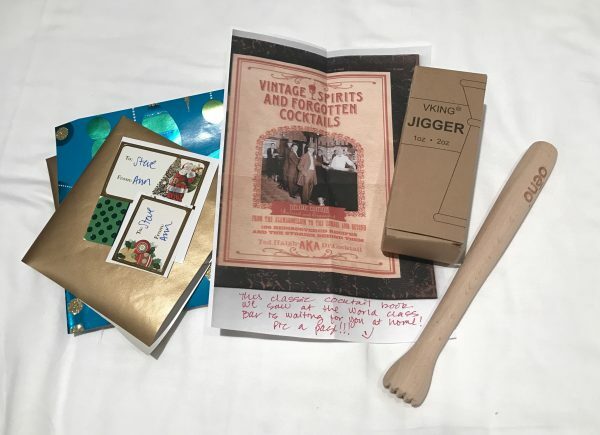 So, for Christmas, I got him a few new things for the bar, including a wooden muddler, a Japanese jigger, and a cocktail recipe book we’d used during our mixology class. Steve got some new tools for his new cocktail making hobby, including a wooden muddler, a Japanese jigger, and a classic cocktail recipe book (or at least a picture of it). I found the book on Amazon but when it arrived, I realized it was much too heavy to include in my bag. Instead, I made a photocopy of the cover, included a note saying the book was back at home, and wrapped the paper in a small box I’d brought along. All three gifts were easy to pack and Steve loved these new bar accessories. As for the stockings, I didn’t bring the handmade stockings we usually use at home, but did purchase four inexpensive felt stocking at Walmart before we left. I think they were $0.98 each and I added a felt initial for everyone. These $0.98 stockings packed easily and were a fun surprise on Christmas morning. 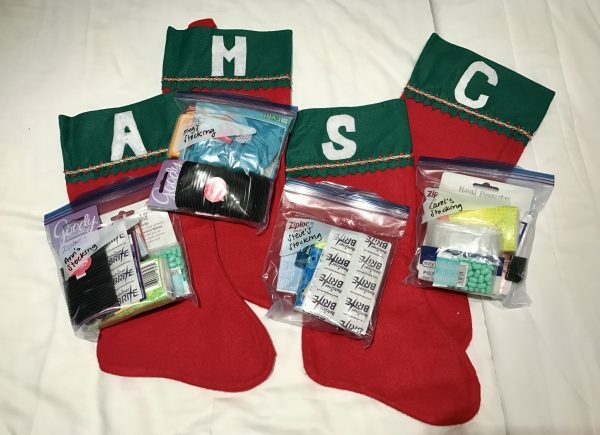 I gathered some small stocking stuffers before we left and separated them in individual freezer bags for each person (including myself). I packed things like gum, mints, hair bands, Kleenex, lip balm, and a family favorite — scratch-off lottery tickets. I received some great gifts, as well. My mom got us two marble cheese plates we’d wanted and some other serving ware that we’d opened at home before our trip. Steve gave me the Magnolia Story book and some new makeup I’d wanted and Meg got me a new lined sketch book and an accessory for one of my favorite bags. We had such a great morning on the ship opening presents and celebrating Christmas. While it took a little extra planning to get everything there, it definitely made for a Christmas to remember. 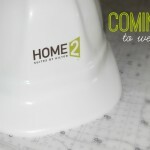 If you like these ideas, please PIN photos to Pinterest! A great way to pack your gifts. Thanks for sharing.